Something I saw while browsing Reddit because insomnia caught my eye. It's a thing about biodegradeable plastics. A thing worth noting that makes this different from current on market 'biodegradeable' plastics. The next paragraph says that the plastic can be "completely converted back to the same molecules simply by heating the bulk material." I put these bits here in my post because, at least as of this moment' the article itself is getting a 'database error' when clicked on. I'm pretty sure it's just the server going 'OH GOD!' and falling over because it made the Reddit front page. From the Reddit Thread: A couple people claiming to have been in the industry for awhile, or at least were twenty years back when biodegradeable plastics were actually new. 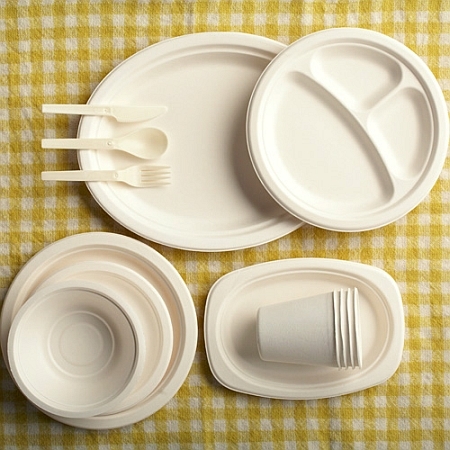 I worked on, and developed, biodegradable/compostable plastic 20 years ago. Nobody wanted it. Ruined my career. I got a job at the UofMN, AgEng Dept. working on agricultural based polymers. At that time, they were using a SMA/starch blend and I had a difficult time believing that was even an option. I only have a baccalaureate degree, so the PhD's rarely took my ideas seriously. I later learned that many of my ideas were tested (and worked) after I went to work for a company that licensed the UofMN technology; and after I helped the company produce a more more viable starch-based packing peanut, they let me go. Thus ending my biodegradable/compostable polymer career. I am not quite sure where the division between natural and synthetic exists. We often took a hydrophobic polymer and modified it to make it more hydrophilic, or the opposite. The professor in charge called them "compatibilizers", but I never liked that term. Is polylactic acid or polycaprolactone completely synthetic? What if you modified it with Malic Acid? At the time, many companies were being criticized for creating GMO's that produced polymers we created synthetically. Is it better to genetically create a plant that produces a bio-polymer at 5% of it's weight, or produce the same polymer synthetically for less cost and less damage to the environment? I'm sorry I sound bitter, but it's because I am. I worked for ACX technologies Chronopol (owned by Coors) back around 1996. We had a Lactide monomer, which we reacted to form polylactic acid. We could form this into plastics. It was completely recyclable and had anti-microbial properties. As the plastic degraded, it turned into lactic acid. It then is metabolized by microbes into water, carbon dioxide and biomass. The process was amazing. It was closed process with the only waste product being steam. We could make just about anything with it. The best part was seeing the applications. For example: To re-paint a jetliner they have to media blast it with plastic beads, collect them, put all that plastic with paint into 55 gallon drums and put it in a landfill. With our beads they could do all the work, collect the beads/paint and we could just dump it back into the process and re-use them to make beads or whatever again. No landfill mess or the cost that goes with large waste disposal. Coors didn't want to invest the extra 100 million to go commercial (long before the ECO movement took hold) and the technology was sold to (i am going to butcher this) Heorghst in the Netherlands. I'll do some reading on what makes his bio-polymer different. My guess would be it can break down faster in a landfill versus other bio-plastics. Seeing that this gentleman is just about 20 miles north of where we scaled up in Johnstown CO. I wouldn't be surprised if he picked up where we left off and fine tuned things. I'll do some reading and get back to you. I can say this: I found that job and what we were doing extremely exciting and satisfying. Having worked and dealt with plastics and plastics waste for many year the benefit to businesses and the planet was going to be huge. We used ADM's waste lactic acid as our raw material. So we didn't have to pay for or create lactide, and they didn't have to dispose of it. From the raw materials to the steam this was just about as close to a perfect solution to plastics and waste. The problem is that PLA is not fully recyclable in the sense that you don't get starting the starting lactide back exclusively. The polymer they have made (and they're not the first to do so) is P4HB and will thermally break down into starting material without any byproducts. Look. I know this is just reposting and cherry-picking comments but these people appear to know what they're talking about, and while I do realize this is actually new I don't want people to just see 'BIODEGRADEABLE PLASTICS BEING RESEARCHED and come to the conclusion that it's completely new. This is mostly because I remember in middle-school science class reading a thing about it. Sure what i read was dumbed down for middle-schoolers, so the content was minimal... but frankly so are a lot of reposted blog entries that talk about something seen in a randomish science paper. I really do hope this goes somewhere instead of cheap jokes about the spoon you're holding dissolving in the stuff you're trying to eat.